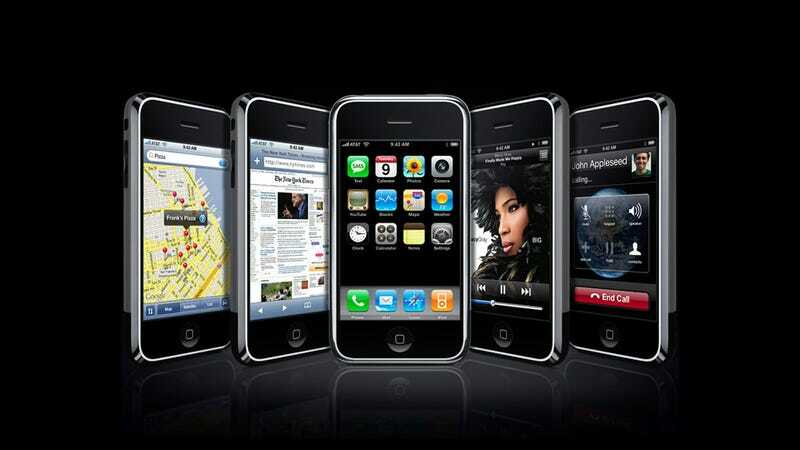 When Apple released the iPhone in 2007, they released iPhone OS (later known as iOS) with it. The device and the operating system necessitated each other. The two were birthed into the world together on the same stage. The industrial design of Apple's new phone was a drastic departure from other mobile devices at that time. The input method was entirely touch based, eschewing the then-accepted truth that physical buttons were the only productive and reliable interface. The operating system was, for many of its users, and introduction to direct manipulation in interface design. The hardware decisions they chose to make were both forward thinking and full of risk. In that way, the physical design of the phone was a concerted bet on their own ability to produce software that could excel at driving it. By 2007 (really, much earlier), mobile phones were already ubiquitously successful. But, smartphones weren't really selling in large numbers. With the release of the original iPhone, Apple displayed the first comprehensively successful attempt to create a mass-market, consumer-friendly, always-on, pocketable touch screen computer. And in doing so Apple had created for itself the difficult charge of teaching the consumer how to a use such a device. Its design of the system software, in its early days, was informed by the assumption that most users would be arriving at their device limited knowledge of how to use it. The iPhone's software was designed to introduce its hardware. iOS will celebrate its sixth birthday this year. It has evolved, impressively, from its beginnings. But, since those beginnings, it has carried the weight of having to teach its users. It needed to both function and to instruct. Today, that focus on instruction, which was at one time a marked advantage for iOS, has become something of a burden. iOS is pinned down by its early interface decisions. Decisions that were made to help users relate older, physical ideas to this new, touch-driven software platform. Many of the skeuomorphic tendencies in iOS that bring derision from critics today, were the same instructive design decisions that helped bridge the industry from physical buttons to touch screens. And Apple's loyalty to those decisions has left them with a mobile operating system which feels decidedly less modern than its peers. Apple's hardware execution, its iterations on the iPhone, has been focused and tremendously successful. But, the perception that its mobile OS has aged poorly is a growing one. With many consumers now shopping for their second (or third) smartphone, iOS's instructive conventions can appear restrictive and simplistic. Six years after creating a product category and teaching the world how to use it, Apple's mobile operating system now exists in a world full of people who understand how to use it (and devices like it). Moving forward, iOS has the difficult task of adapting to this new world from a position of strength in the old one. To be more clear, I'm not broadly arguing against instructive interface design here. Just trying to note that a lot of the criticism aimed at iOS's current design trends seems to be oddly disconnected from the praise that was heaped onto those same design trends just a few years back. More discussion on Hacker News. The Tech Block carries select tech-related content that's produced in-house or hand-picked from user submissions that meet our criteria. To publish with us or to learn more about the publishing process, visit our publisher page.